I purchased Chanel Illusion D'Ombre Eyeshadow in Mirage on a whim; I wanted a soft golden/bronze cream shadow, something subtle and buildable. I had heard these eye shadow pots were incredible and after playing with them at a counter, I picked up Mirage. The colour is a delicate bronze shade with warm undertones and metallic sheen. The texture is buttery soft and incredibly easy to blend. The texture of the product allows it to be built up; to get the colour that it appears in the pot, you need to apply a few layers, which makes these eye shadow pots incredibly versatile. By sweeping a layer onto the lid and building product into the crease, you can create a delicate, subtle smokey finish. I've seen the Chanel Illusion D'Ombre being compared to the Maybelline Color Tattoo Cream Eyeshadows and I have to say, I'd choose Chanel every time. I find the Maybelline Color Tattoo Cream Eyeshadows are harder to work with, the texture is tough and awkward, and the colours are bold with less range for creating different looks. With the Chanel Illusion D'Ombre Eyeshadows, the colour is softer, more sophisticated, and the texture is far more pliable providing many more options for application. Shu Uemura makes my absolute favourite BB cream - the Stage Performer BB Cream - and yet I had not tried any of their other products until I picked up the Petal Lash Mascara. I typically look for a huge mascara brush to create thick, bold lashes - this mascara is completely different. The brush is thin with a curved wand making it easy to wiggle into the corner lashes, separates them, and adds an even layer of colour. While this mascara won't create a dramatic look, it does produce perfect lashes; the formula coats the lashes with colour evenly, separates, lifts, and creates a natural finish. The formula doesn't flake, smudge, or irritate, and despite being waterproof, it's easy to remove without scrubbing. While it's not going to replace my favourite mascara, I can't fault the Shu Uemura Petal Lash Mascara at all. 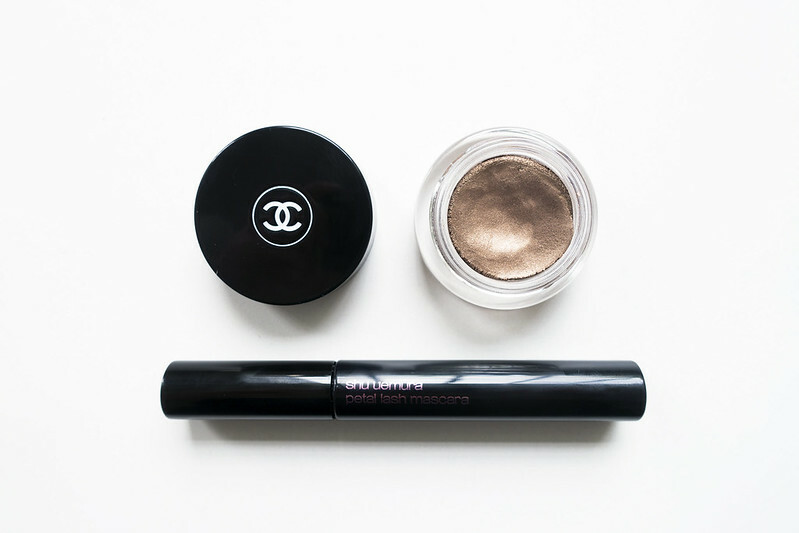 Paired together, the Chanel Illusion D'Ombre Eyeshadow and Shu Uemura Petal Lash Mascara are perfect for summer. I need to get such an eyeshadow! They look gorgeous and so natural on eyes! That eyeshadow looks perfect for the summer! The shadow cream looks the perfect mix of gold and bronze, and it's nice to have a product that isn't too slippy or drying on the lid - this seems to have all areas covered! Ooooh, I have Mirage too. Love it so much! I alternate between that and Emerveille as easy sweeps over the eyes for a simple look. I tried the Petal Lash Mascara too but it didn't work on me (the lashes drooped): ). Pretty products nonetheless! That looks like a nice everyday eyeshadow color and the mascara sounds like something I would like. Such a beautiful shade ! I love that shadow, it is a beautiful colour. I don't know if I could bring myself to spend the money on a Chanel beauty product, but that is certainly an absolutely beautiful colour! Yay for a beauty post! :) I will definitely have to check out the Chanel eyeshadow. I just bought two pots of Charlotte Tilbury's "Eyes To Mesmerize" eyeshadows in Jean and Marie Antoinette. I think they are similar to the Chanel shadow, but a bit lighter. I would love a darker bronze for fall. I love how easy the cream shadows are to apply (I use my finger) and they don't crease at all. That's perfect for summer. And my favorite mascara in Ardency Inn's Punker. I swear my lashes have gotten longer since I started using it about two years ago. There's more coming! :)) I haven't tried the CT eye shadows, I might check them out. I usually prefer palettes and powder shadows but this Chanel eyeshadow pot is perfect and really ideal for travelling with. I've tried a few Chanel products and I honestly think they're worth the money. I haven't found any other "drugstore dupe" that comes anywhere close to comparing with this eyeshadow pot. I really love the colour of Mirage because it's subtle even though it's a golden-bronze hue, it works really well on its own or blended with other products. The mascara is great for natural lashes and once I got the hang of using it (the brush is a bit weird) it works really well on my lashes, but I do prefer something with a bit more POW. They definitely pair really well together. The mascara definitely isn't my favourite and I suppose it would work well with the Shu Uemura eyelash curler, but I do like how natural the finish is. It's super light when it's applied and can be easily built up, which is why I think I like it so much. It really is - so subtle and summery. I really recommend this one, I haven't stopped wearing it since I purchase the pot.